If you’ve never set up a raffle before, you likely have many questions, and one of them might be about where to get raffle tickets. If you have a computer and a printer at home, there’s no need to get them printed at a print shop. You can create and print perfect raffle tickets yourself, using our free raffle ticket templates. Some states have a list of prohibited items, such as animals and alcohol, so check the laws in your area to ensure that you comply. Many community businesses will donate prizes for the raffle; all you have to do is ask. They’re generally willing to do that because they understand the goodwill that is generated from their contribution efforts. To make your raffle give-away as easy as possible, consider the 50/50 raffle, where 50% of the proceeds generated from ticket sales goes to the drawn winner of the raffle, and 50% goes to the organization raising the funds. Besides being easy to award the prize, it also eliminates the hassle of securing merchandise. Following is a step-by-step tutorial on how you can make free raffle tickets using our templates in Microsoft Word. You may find this YouTube video on Creating Raffle Tickets in Microsoft Word helpful if you like visual explanations. This simple raffle ticket design made of two parts. Top part (ticket) is very basic, and the space is limited to the name of your raffle event. Bottom part (coupon) is for the participants who do not need to fill in their information (name, address and phone number). You can number your tickets using this spreadsheet. These raffle ticket templates come pre-filled, but you have to option to change the ticket numbers by following these directions. Enter the first ticket number in cell A2. In the example, we’re using 1 as the first of 40 tickets. Select the cell, and then move your cursor to the bottom right corner of the cell. The cursor will change to a solid black T or “+” sign. Drag it down, making a note of the line you’re on. Since we’re making 40 tickets, drag down all the way to cell A41 (40 tickets, plus your heading row). At A41, stop dragging and release. All cells should now have the same number in them. To fix this, use the autofill feature which is explained next. There’s a small icon in the bottom right corner that reads “Auto-Fill Options.” Click it and choose “Fill Series”. Your numbers are now sequential. This is a Microsoft Word file with the ticket designs. You can use them as they are or modify them as desired. You’ll still need to make some changes before you can create your own tickets. Note this file has a single ticket. We’ll roll out this design to other tickets later, so if you decide to make changes (to the text, font or color), do it here. Once you’re finished with the design, go to the “Mailings” ribbon to start the mail merge. You’ll see that the “Update Labels” is grayed out. Change that by clicking on Start Mail Merge > Labels > Cancel. Click on Update Labels in the “Mailing” ribbon, and this will roll out the formatting to all the cells. You can click “Preview Results” to see what the tickets will look like when printed, and you can navigate pages and tickets by using Next Record, Last Record, Previous Record, or First Record. If you’d like to make any further changes, you can update the very first ticket, and then click “Update Labels” to apply the changes to all tickets. Once you’re happy with the design, click Finish & Merge > Edit Individual Documents > All > OK.
You now have a new file called “Labels1” with all the tickets in it, all sequentially numbered. They’re ready for you to print and cut. This is a Microsoft Office document created from the Template Design File. If you followed the steps correctly, this is what your “Labels1” should look like. If you’re raising money for a sports organization, choose a template featuring sporty images. LIkewise, a template with musical notes on it fits in well for a band-related fundraiser. However, if you need a basic template that works for any function, we have simple designs that fit any general need. Office supply stores and craft stores carry papers in various weights, and these are both good places to buy card stock. Some stores sell raffle ticket paper that’s already perforated, so using this type eliminates one of your most time-consuming tasks. Finally, it’s time to start selling! Where do you go to make as many sales as you possibly can? While some locations may be easy, you might have to get creative to think up other selling possibilities. Grocery stores: A folding table and a couple of colorful posters are all you need to set up an attractive display outside of a grocery store or supermarket. People are going inside to shop, so they have money. Other venues: To expand your selling efforts, consider any and every place where there’s a lot of foot traffic. You can sell raffle tickets at church potlucks, outside of convenience stores and drugstores (with permission), and at PTA meetings. Generally, you don’t want potential buyers to have to do a lot of math in their heads. Make it easy on them by offering a bundle price. Explain what your fundraiser is for without going into too much detail. Ask buyers for their help in reaching your goal. Smile! Be friendly and approachable. You’re raising funds for a cause that you’re passionate about, so let that shine through. People respond to genuineness, and when they can see how much you care, they’ll be more likely to buy from you. The Fundraising Authority advises to offer several payment options because a lot of people pay with debit and credit cards these days, so they sometimes don’t carry cash at all. Also, wherever you are, be visible! Use signs and other attractive displays to help ensure everyone sees you. When you’re ready to print your tickets, choose one of our handy raffle ticket templates. 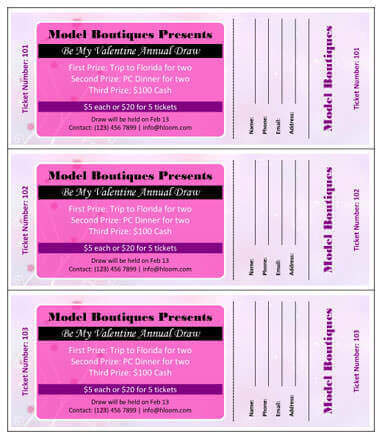 They allow you to include necessary details, such as the organization hosting the raffle, blank lines for the buyer’s name and contact information, prizes offered, the ticket price and the date the drawing will be held. 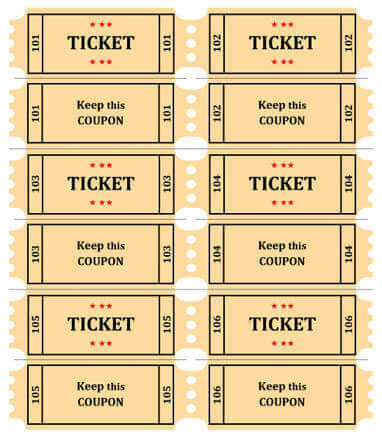 Below are 15 printable ticket raffle templates which are easy to use and customize. 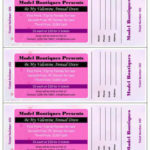 You’ll find choices for basic business types and kid-themed tickets as well as templates for multiple prize options. 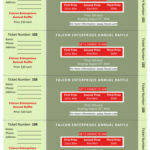 Simply find a raffle ticket template that you like and that fits your overall purpose, and make the necessary changes. It’s all that easy. You might have to take a trial-and-error approach to DIY printable raffle tickets, but once you get the hang of the process, you can use the same format as much as you like. How do you go about sequentially numbering for your raffle tickets? You can do sequential numbering manually, or you can use Microsoft Excel in a mail-merge type of operation. If you’re not sure how to go about the mail-merge, the directions are above in the Template Design File section. Once your tickets are printed, then comes the task of cutting and perforating the tickets so that you can easily tear the ticket from the stub. It’s not as hard as you might think. With a full-size paper cutter and an inexpensive tracing wheel, you can easily complete this part of the job. To make it a community effort, get help from your fundraising colleagues. A morning spent on this task — with the enticement of coffee and doughnuts — will fly by when you’re having fun with other people. 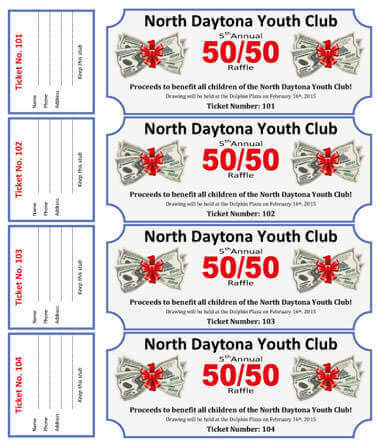 A four-color (red, blue, taupe and cash green) raffle ticket design for a 50/50 draw benefiting a youth club. Would make a perfect advertising poster or newspaper ad. A two-tone blue-grey ticket without picture. It’s easy to change the color and very business-like in appearance. This ticket shows three prizes to be won with room for more should you need it. A ticket for a 3-prize prize draw in two shades of restful green with a red ’ Hey – look at me!’ prize block in the center of the ticket. 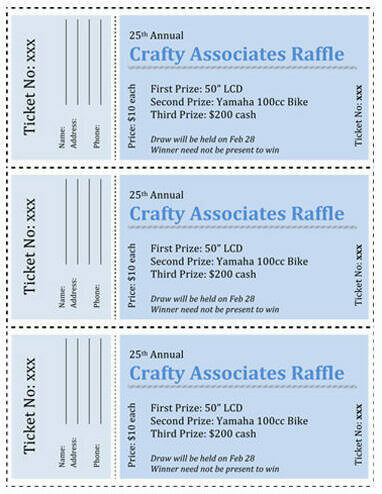 A ticket for a raffle featuring three prizes. Valentine pink with a lavender background, springtime is the season of love. 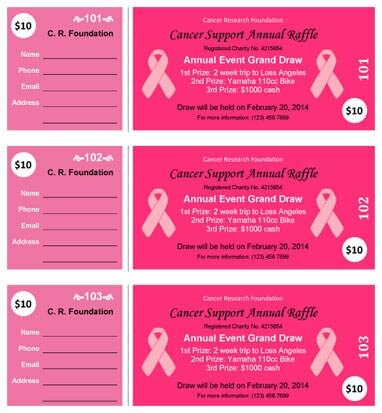 A ticket for a cancer charity raffle event. Two shades of eye-catching pink. Space for three prizes and your registered charity number which purchasers will find handy come income tax time. A ticket for a cash raffle. Cash – always a favorite prize. Done in blue and steely gray background with eye-popping green cash prizes that seem to jump off the ticket. 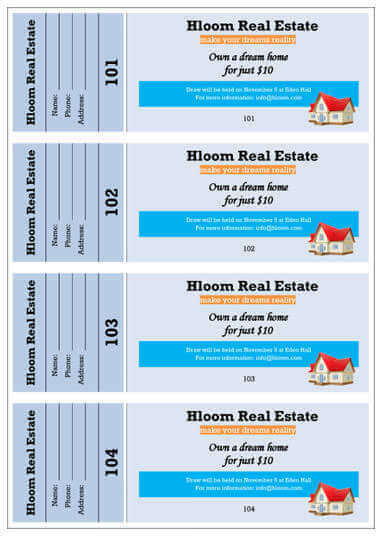 A basic ticket for a dream home prize draw. Very basic and easy to modify, with ample space for additional details. Two shades of blue/gray with a bright blue information box as well as a smaller orange box. Picture of the house in the corner can be changed to a picture of your prize. A ticket for a cash prize draw in aid of children. Delightful! Eye-catching picture. Six colorful whimsical caricatures of smiling children and a smiling pussycat. Festive pink and yellow background. Two lovely shades of springtime green. A ticket for raising money in aid of repairing of a building, a renewal – like spring! A 50/50 raffle. It’s simple design could easily be adapted to a poster advertising the raffle. 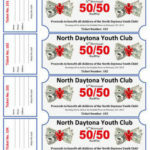 A free ticket template for a combination 50/50 and prize raffle, with a automotive/travel theme. Screened in gray background of a highway with a sporty red car in the corner. The car can be easily swapped for another vehicle. A beautiful full color background photo of a country meadow on a sunny summer’s day. The ticket is for a single prize of a club membership but there is plenty of space for additional prizes. A ticket for a 50/50 draw with a soccer theme. Featuring a vivid photo of a soccer ball resting on the soccer field grass. 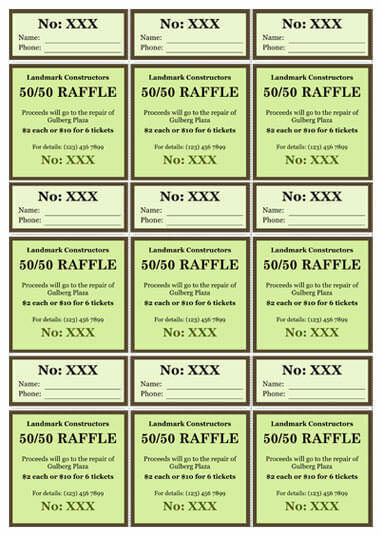 A colorful 50/50 ticket on a solid background, this one for a sports raffle, with a picture of a rugby player about to pass the ball. The player is easily changed to an athlete of your choice. A sunshine yellow background with a shiny new red Hyundai up for grabs. Three car photos, easily changed to another model. The ticket would make a good advertising poster.